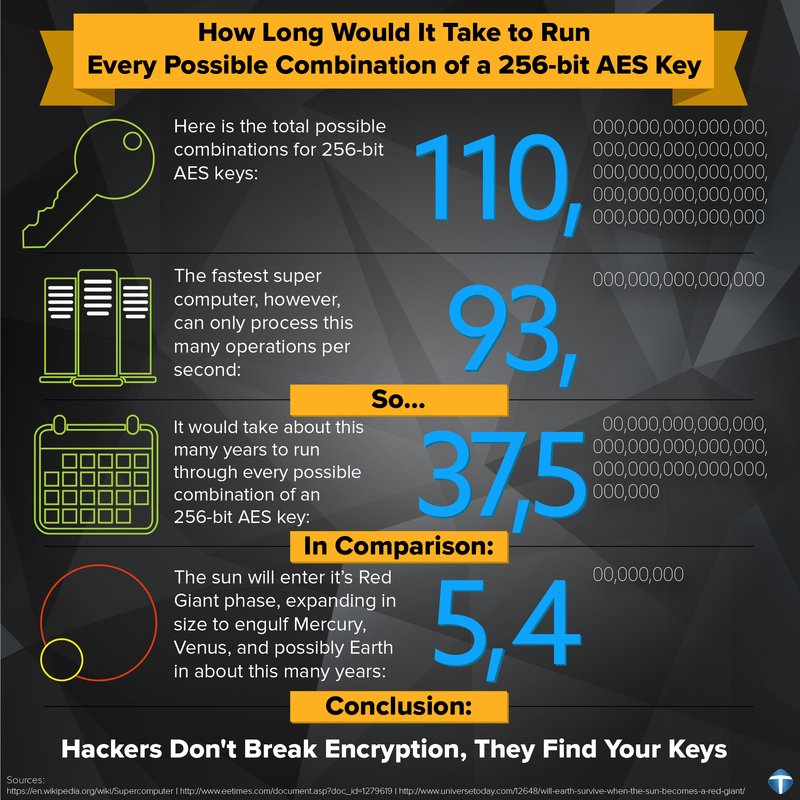 How safe is a AES 256 Bit Encryption? AES-256 is a key generation method used to securely encrypt your data and prevent unwanted access to your files. Tools like VComply use this type of encryption to secure users data and transactions. But the real question is how safe is AES 256bit encryption really? When referring to AES-256bit encryption, one should refer to the key that is generated while the machine conducts the encryption. The data itself is secured by the software by creating a ‘key’ that uses 256 bit encryption to unlock that data; by finding the key, one would be able to unlock the chest. The math behind AES-256 is fairly straight forward, but very important to understand as it relates to the real world. A 256bit encryption is the mathematical equivalent of 2256 key possibilities. To put that into perspective, 232 is about 4.3 billion, and it keeps growing exponentially after that. What does this mean though? Well simply put, let’s say hypothetically all the super computers in the world (the ultimate brute force attack) decided to group up and tasked themselves to decrypt your AES-256 key so they could access your data. Assume they could look at 250 keys per second (which is approximately one quadrillion keys/second – a very generous assumption). A year is approximately 31,557,600 seconds. This means that by using the one billion super computers required to do this, they could check about 275 keys per year. At this rate it would take these computers 234 years (the age of our universe) to look at less than .01% of the entire key possibilities. The bottom line? No one will be breaking your encrypted data. Every person on the planet owns 10 computers. There are 7 billion people on the planet. Each of these computers can test 1 billion key combinations per second. On average, you can crack the key after testing 50% of the possibilities. Then the earth’s population can crack one encryption key in 77,000,000,000,000,000,000,000,000 years! The bottom line is that if AES could be compromised, the world would come to a standstill. The difference between cracking the AES-128 algorithm and AES-256 algorithm is considered minimal. Whatever breakthrough might crack 128-bit will probably also crack 256-bit. SO 448 BIT ENCRYPTION MUST BE BETTER? 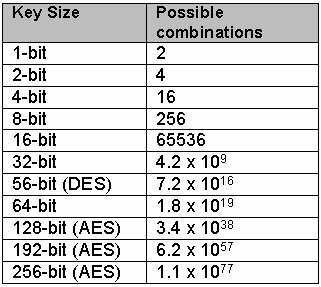 Why do we use AES 256 bit encryption over any other format. The bottom line is that more isn’t necessarily better. 256 bit encryption so far has proven to be unbreakable. Moving to a 448 bit encryption doesn’t realistically change the likelihood of hacking your data. More importantly however, 256 bit encryption has had a significantly more public and industry testing. This means that since its inception, AES-256 has undergone excessive public and private hack-testing and has continued to reign supreme in protecting its data as the best solution for data encryption. Although 448 bit encryption sounds better – being a bigger number and ‘more secure’, in reality it hasn’t undergone the same testing that AES 256 has been through. Use the industry and time proven standard of AES 256 bit encryption, and don’t risk moving to 448 solely because it sounds better. So what does this mean for your data? Well, this means that by choosing AES-256 bit encryption to backup your data, you can be assured that you will be the only one who can access your critical information. With us your data’s keys are privately held by you and we use AES 128 or AES 256 so that you can be assured that your data remains yours. In the end, AES has never been cracked yet and is safe against any brute force attacks contrary to belief and arguments. However, the key size used for encryption should always be large enough to not be cracked by modern computer. You may read about the biggest Data Breaches of the 21st Century here. Previous PostPrevious What are the 7 quality control tools in TQM? Next PostNext What are the common types of mergers? Take control of the uncertainty of risks by identifying and managing them effectively! Great blog, Thanks for taking the time to conduct this research and then share it with the community! For making strong Encryption Key You can also use http://www.allkeysgenerator.com/ . It is very easy to use and make strong Encryption key which is not cracked easily by anyone. Why is Mitigating Risk Important? How to survive in an ever-changing business environment?